Photo: Even on highly structured treads of winter tyres, the innovative material provides a secure hold. At the same time, it protects against discoloration through substances migrating out of the adhesive or the tyre. The market for inkjet labels continues to grow fast. Pioneering the development and manufacture of the self-adhesive materials needed for these applications is Germany-based VPF GmbH & Co. KG. 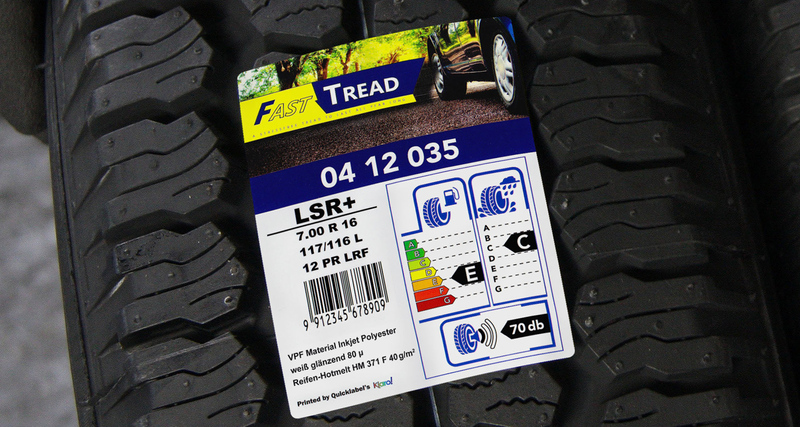 Among its specialities are tailor-made solutions for tyre labels that enable users to achieve excellent colour printing results. The company presented its product portfolio at the Tire Technology Expo 2016 in Hannover for the first time. The main focus was on newly developed self-adhesive materials enabling a variety of individual finishes, thus expanding the application spectrum for high-quality inkjet labels still further. The ability to perform colour printing in-house with inkjet self-adhesive materials offers tyre manufacturers and dealers substantial advantages. What impresses users above all is the flexibility and speed of customized label printing that allows printing on demand of specific quantities of labels with interchangeable texts and language options, as well as different colours and logos. This is especially helpful when tyre specifications change at short notice, damaged labels have to be replaced, or imported tyres need to be relabelled. At the Tire Technology Expo 2016, VPF exhibited a comprehensive range of tyre-compatible self-adhesive materials, all based on the special tyre adhesive HM 371 F which has been trusted in the market for many years as a standard for tyre labels. The focus at the exhibition was on three innovative inkjet facestocks. VPF and a leading manufacturer of inkjet printers jointly presented these to trade visitors as a system solution. The premium material Inkjet PET 80 µ in glossy white (VPF 60363) is the first choice for shining printing results and top functionality. In addition, the high-gloss Inkjet paper 87 g (VPF 8093388) with permanent lamination of a polyester barrier was introduced as an attractively priced alternative that also permits high-resolution colour printing. Making its debut was the Inkjet Special PP film in matte white 85 µ (VPF 60241) designed especially for use with pigmented inks that are recommended for use in difficult environments, for example outdoor storage of tyres, because of their resistance to abrasion and UV light. All new self-adhesive materials are manufactured with barriers to prevent migration of oils and plasticizers from the adhesive and tyre materials. Each of the new inkjet facestocks presented can be combined as desired with the known tyre adhesive HM 371 F in typical application weights of 35 to 52 g/m2. Furthermore, the self-adhesive labelstock can be provided with double-sided siliconized Glassine liner as well as with adhesive-free areas at the right and left edges of the roll, if customers require this for improved storage and downstream processing. 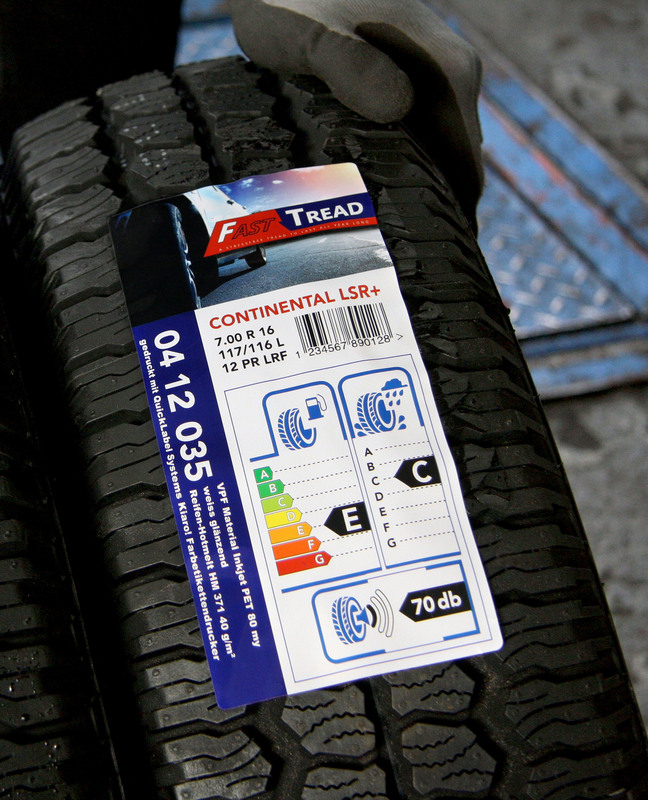 It is the combination of the right facestock, matching adhesive and the right finish which makes all the difference when it comes to safe and secure tyre labelling. As an expert in self-adhesive materials for tyre labels, VPF has been serving this market for many years with its tyre adhesive HM 371 F, also in combination with other typical facestocks such as OGR paper, Special Data PE film, PP films, thermopaper, aluminium reverse coated paper materials and polyester. With these three new inkjet tyre materials, VPF is uniting its strengths in the inkjet self-adhesive materials segment with its long-standing expertise in tyre labelling to offer customers a complete range of individually combinable facestocks for all common printing methods. Photo: The newly developed premium self-adhesive material Inkjet PET 80 µ white, glossy (VPF 60363) enables top quality results in tyre labelling. Since 1967, VPF has been supporting and shaping the European market for self-adhesive materials and coatings as an idea generator, partner and problem solver. Expertise and a strong focus on customer and market needs are the foundations on which the company develops innovative solutions. With state-of-the-art production facilities, dedication and flexibility, VPF turns these solutions into quality products for paper and film applications of all kinds.